It's simple: we got nuthin.' The photo at left presents us with a true mystery - we do not know the identity of the pilot, his kite or his unit. Even the artwork is unfamiliar, so add the identity of the nose artist to the mystery. If you have any clue as to the identity of anyone or anything in this photo, please drop us a line! In December 1944, a local teenager was walking along Elder Street when a Mustang came crashing through the perimeter fence and wound up in the field across the road. That teenager is A4FG member and Saffron Walden resident Keith Braybrooke, and he has no doubt about the details. You see, young Mr. Braybrooke kept a diary. a halt across a ditch to my right, just to the west of the North/South runway. deep ploughing in that area, and he remembered my experience, so when he found some shell cases etc, he gave me one as a keep-sake. accurate, and I can see it now in my mind as if it was yesterday." The tri-colored rudder and the number in the squadron code make it a war weary kite, either a squadron hack or a Clobber College trainer. Group records mention the crash of QP-4 two weeks later; and there was also mention of a 355FG kite crashing at Debden on 18 December. But there is no mention of QP-2, which was a total loss. The Association's aircraft inventory has no QP-2 listed. 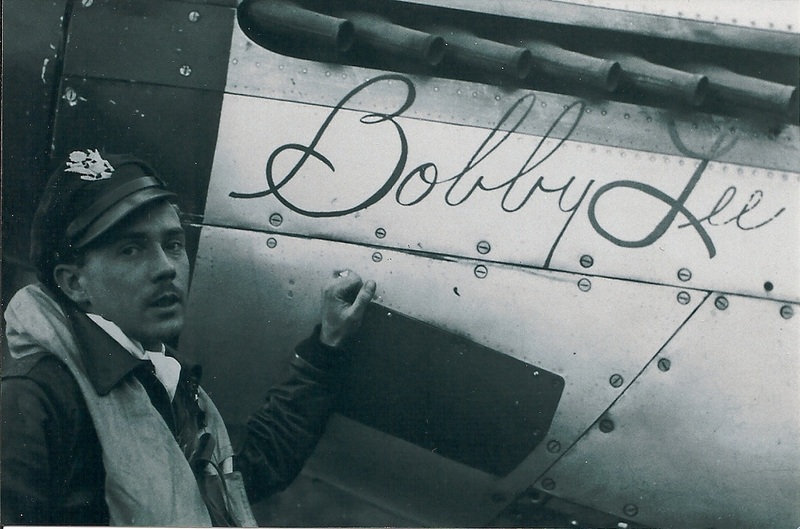 There is also no mention of an injured pilot in any of the squadron histories. Who was this man, and what kite was he flying? after a forced landing in Pennsville, NJ on 4 May 1943 while on a training mission. 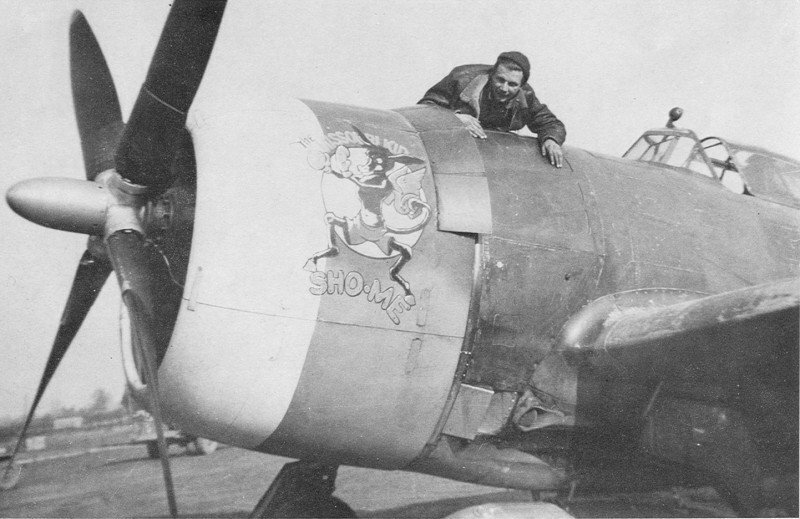 The notation "6484" in the 334 squadron history thought to be the serial number of The Missouri Kid/Sho-Me actually refers to a map grid coordinate in England which pinpoints the location of the crash site of P-47D-1-RE 42-7874. This kite, coded QP-L went down on Moat's Farm outside the village of Kenton with F/O John McNabb at the controls on 2 December 1943.
coded QP-L, though we have no photographic proof of that. Hofer was assigned QP-L as his personal kite in the middle of January 1944. There are at least six C model Thunderbolts known to have served at Debden for which we have no corresponding squadron code; it's possible Hofer's kite was one of these. This mystery likely won't be solved until someone discovers a photo of The Missouri Kid/Sho-Me which reveals both the squadron code and serial number. If you have a photograph like this, you've just become our most popular site visitor. 4th aficionados everywhere are waiting for you to send in a copy! 25 September 2013 - Thanks to Nigel Julian, with some assistance from Ted Damick and Peter Randall, the identity of The Missouri Kid/Sho Me has been uncovered. It is 41-6413, a 4FG veteran which had previously served as the personal kite of Oscar Coen, Chesley Peterson and Jim Clark before becoming Hofer's mount in January 1944. It had been coded QP-V and QP-W before QP-L became its last 334 code.